The fruit (dates) of the Date palm tree is a staple fruit across most parts of Nigeria. It's cultivated for it's sweet fruit and it's got an oval-cylindrical shape. 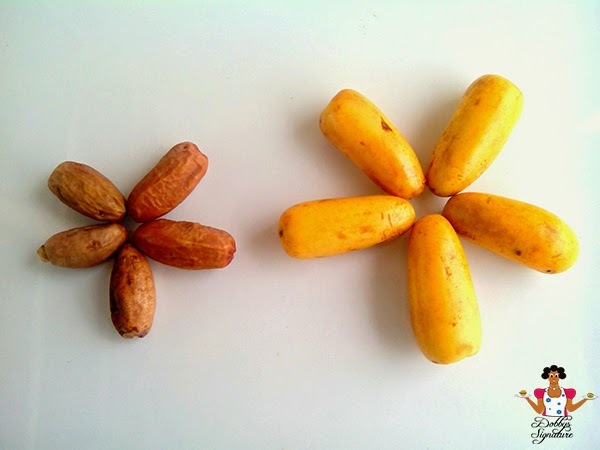 When ripe, it has a bright yellow color and when dried, it turns brown. Botanically they are known as Phoenix dactylifera from the family of Arecaceae, in the genus Phoenix. In Nigeria, it's not unusual to see northern vendors carrying around the Date "fruit" in wheel barrows especially the dried version which has a sweet taste unlike the fresh fruit which has a sour taste. Although dates can be eaten fresh, it's often sold dried therefore resembling large raisins. Dates are very high in sugar content with about 66.5 grams per 100 gram serving of the fruit and about 20–70 calories each, depending on size and variety . Dates also contain Vitamin B6 (0.2 milligrams), Copper ( 0.4 milligrams), Manganese (0.3 milligrams), Magnesium (54 milligrams), Fiber (6.7 grams), Potassium (696 milligrams). According to research, 100 g of dates hold 277 calories. • Energy Booster: Due to the high sugar content contained in dates, they are great energy boosters as they contain natural sugars like glucose, sucrose and fructose. To get more advantage add dates to milk and make it a very nutritious snack. • Reduced Blood Pressure: Date fruit contains Magnesium has been shown to help lower blood pressure. Additionally, potassium is another mineral in dates that has several functions within the body, aiding with the proper workings of the heart and helping to reduce blood pressure. • Boosts Heart Health: In addition to promoting colon health, fiber is also known to boost heart health. • Reduce risk of stroke: Rich in potassium and low in sodium, this helps regulate a healthy nervous system and can reduce risk of stroke. • Low in cholesterol: Dates are free from cholesterol and contain very low fat. Tanx Dobby , the high sugar content scares me away frm it. will make it my hand carry snacks frm today. You're welcome chioma. It's definitely high in sugar content but the other nutritional benefits make it worth it. Lmao! Was trying to figure out what you meant by kwiri kwiri when i remembered Kuli kuli :D :D. No it doesn't have an igbo name, even the hausa vendors call it "date"
It has a Hausa name. It's called Dibino in Hausa. I'm just knowing the English name tho. yes it has an igbo name "Ube okpoko"
These things are so sweet, and the texture is amazing. They taste great in Banana spinach smoothies too. Can i find it at Agboju market? Yes you can. Those that sell Tiger nuts "Ofio/Hausa groundnut" usually have it. Dobby is Tiger nut the English name for Ofio @ your comment? Hi Anon, Yes it is. Ofio is what tiger nuts is known as in the western part of nigeria. It is also called Dabino by the Hausa vendors. Please what is the Yoruba name because I still don't know it.